The Blackwood Company is a mercenary-like group and competes with the Fighters Guild. They are known for taking less scrupulous jobs and seem to operate without moral qualms. 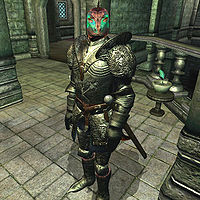 By undercutting the Fighters Guild, the Blackwood Company grew to over a hundred members and is becoming a serious threat to the Guild's existence. 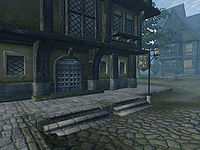 The faction is based out of Leyawiin, with their headquarters directly across from the Fighters Guild Hall. The Company also maintains an outpost inside of Glademist Cave. The company began when a group of former soldiers failed to reclaim territory in Black Marsh for the emperor. They came to Leyawiin and continued to ply their mercenary trade. The Company's second-in-command, Ja'Fazir, explains that the name "Blackwood" refers to a part of Blackwood Forest. The name also carries a reference to the "thoghatt", or "charcoal warriors", of Khajiiti tradition. The Blackwood Company mercenaries wear a unique set of commissioned Blackwood armor, heavy armor engraved with the faction's emblem of a sword and axe at the roots of a Hist tree. † Maglir only joins at the start of the More Unfinished Business quest. Three Argonians (all with the same BaseID) in Glademist Cave. Four Imperials (all with the same BaseID), also in Glademist Cave. One Imperial, one Argonian, and one Khajiit who accompany you during the Infiltration quest. One dead "Blackwood Company Member" will also be found in Forsaken Mine. He is not officially a member of the Blackwood Company, but faction membership was probably considered irrelevant given that he is always dead. In a later Fighters Guild quest, Infiltration, you will be asked to infiltrate the ranks of the Blackwood Company by joining them. The faction will appear in your journal once you are officially considered a member. Only one rank is ever available to you, which is Company Member. Azani Blackheart: Help Modryn prove that the Blackwood Company lied about completing a contract to kill Azani Blackheart. Information Gathering: Bring Ajum-Kajin - a high-ranking Blackwood Company member - back to Modryn and "persuade" him to talk. Infiltration: Deceive your way into the Blackwood Company and discover why they are so powerful... or so crazy. The Hist: Return to Blackwood Company headquarters to destroy the source of their power and anyone that stands in your way. Esta página foi modificada pela última vez à(s) 05h43min de 18 de junho de 2015.